How many calories in fish? Fish is a rich source of Omega-3 fatty acids which decreases the growth of fat cells, therefore can be a great addition to your weight loss program. Calories in fish are normally low due to the low fat content in white types of fish such as: Sea Bass, Haddock, Cod, Mullet, Monkfish, Sole, Halibut, etc. When purchasing fish, check to see if it's farmed as the calorie content may be higher due to an increased probability of fat. Also, how you cook fish may affect the number of calories - choose steaming and grilling fish over frying fish. Whilst oily fish calories are significantly higher, oily fish is a very good source of essential fatty acids such as omega-3. The health benefits of omega 3 include lowering the risk of both heart disease and cancer. It is a natural source of vitamin D which helps in the absorption of calcium. 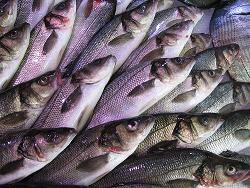 A portion of oily fish such as: salmon, mackerel, herring, tuna, or sardines is recommended at least once a week. For people who do not like fish, we recommend a supplement of fish oil. There are links below to calorie tables for a large assortment of fish. If we do not show the fish your are interested in, please let us know and we'll get it added. All of our calorie information is sourced from the US Department of Agriculture. At the bottom of the page, we've also added several delicious fish recipes for you to try.